At Sakurai’s office, Woo Joo is staring moodily at the laptop and Ren’s proposal on Facebook. Taka come and takes a look and wonders who the girl could be. When Woo Joo says nothing, Taka guesses it might be Luna. Again, silence. That’s impossible, right? Woo Joo gets up and leaves while Taka looks at the proposal and wishes he had a girl to propose to. LOL, at least some humor in this rather heavy drama. Meanwhile, phones are ringing off the hook thanks to the proposal. Major newspapers are already posting articles and the press are calling like crazy. Everyone is trying to figure out just who the lucky lady is. Of course, Luna isn’t saying anything. She gets a call from Woo Joo and she asks if he saw. Woo Joo says he did and asks if they for sure broke up. Luna says that they did. Plus, she doesn’t think they should see each other any more as she needs to focus on this project. She then wishes Woo Joo good luck with his styling. Aigoo. Mr. Hirouchi is livid that such a scandal broke out. Evildoer #2 apologizes. He has no idea how such a story could come out on the company’s Facebook page. Ahhhh. So did he do it and not Ren? Before the company’s PR could take any measures against this leaking out, it was spread to all major news outlets. Even though the PR team is active in trying to contain this, it’s not possible to get the news completely eradicated. Mr. Hirouchi tells Iga to stop making excuses. Has this news traveled to the CEO? Iga says it looks like he doesn’t know yet. Hirouchi then orders the PR team to do whatever it takes to suppress the news. Iga agrees and goes to leave, but before he does, Hirouchi asks for Kei. Iga then calls Kei [Evildoer #1]. Kei is over the moon. He never thought Ren would do something so daring or stupid. 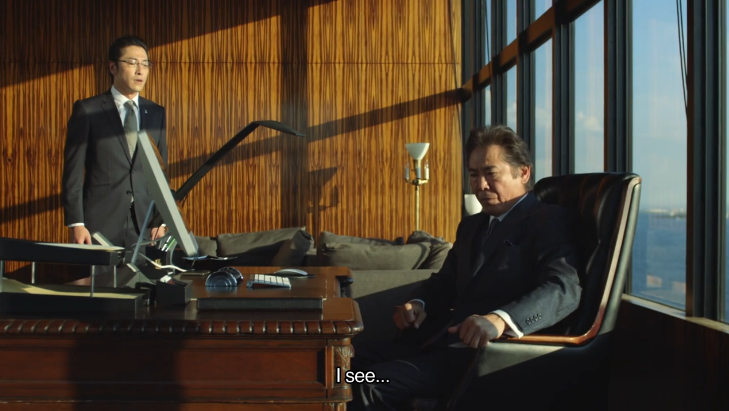 Iga tells Kei that Hirouchi wants him to handle the matter. This makes Kei even happier. 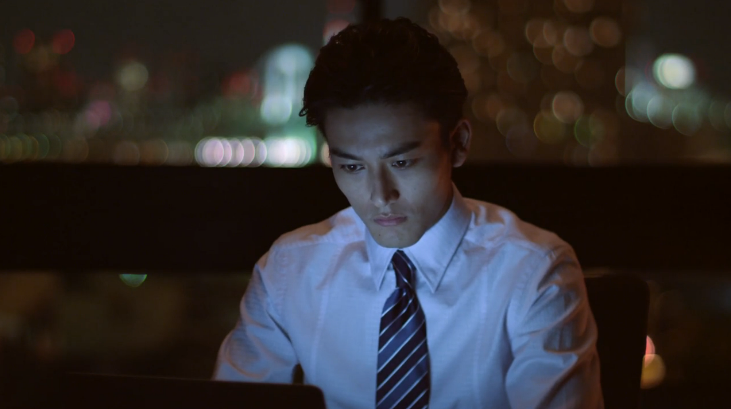 He instructs Iga to tell Hirouchi that he will make the story into something good for the company. Meanwhile, Woo Joo is trying on and picking out different outfits. He then overhears the girls all talking about the Facebook proposal. They wonder who the girl is and then says that they cannot believe such a public proposal. It may be better than a television proposal, but those girls would run away if the same thing happened to them. Yeah. I don’t like public proposals on such a scale. Even if you love the person, it really puts them on the spot. And what if they aren’t ready for marriage? The rejector looks like such a horrible person in the face of the public. Sakurai is at PISTOL STAR HQ talking with Misaki. They are doing a test global launch with the men’s brand before going ahead with their main women’s brand. They will be heavily utilizing Twitter and Facebook for the launches. They are also seeking those born in the 90s and those with fluent skills in English and Chinese. They are going at full-speed at launching PISTOL STAR as a global brand. Sakurai is impressed since PISTOL STAR doesn’t even have a flagship store. How rare. Misaki says this is all Hirouchi Ren’s doing. Sakurai then asks Woo Joo how the styling is going. Woo Joo nervously says okay and then asks Sakurai to check it over. Sakurai goes through all of Woo Joo’s choices, not liking any of them. He then asks Woo Joo what brand he’s wearing. Woo Joo says his outfit is put together from several different brands. Right? It’s men’s specs and how they wear their clothes that is determining the style now. It’s a stylist’s fatal mistake to only use name brands. Same for adverts. Sakurai tells Woo Joo to redo everything and leaves. Poor Woo Joo. But he’s not disheartened at all. He quickly gets back to work. He’s getting the education and experience needed to eventually stand on his own two feet thanks to Sakurai. Luna brings the hardworking young man some coffee. Break time. He apologizes for making her stay late and says he’s almost done so they can leave soon. Luna says it’s okay since she has lots of work to do. He asks if she’s okay and Luna says love and work are different. She always feels calm in a pressroom surrounded by clothes. She then asks Woo Joo what made him want to be a stylist. Woo Joo confesses he doesn’t like to be around a lot of people and thus always did things on his own. This, of course, means he wasn’t good working in groups or as part of a system. He thinks rules are meant to be broken and is bored if he can’t defy common sense. Thus he chose being a stylist whose moment-to-moment sense suited his personality. Woo Joo smiles and then tells Luna he spent his teen years lying about his age to get in to see his favorite bands. He also shirked schoolwork to translate lyrics. This makes Luna smile. It was around this time he started reading Japanese music magazines and studying Japanese on his own so he could understand them. One day he came to a picture that made him stop. Those people seemed as if they lived in a different world. The man who had done the styling for that photo was none other than Woo Joo’s idol Sakurai Kenshin. Luna is impressed by Woo Joo forging his own path in life. Woo Joo thinks about this and comes up with a phrase in English. His English speaking skills are not half bad. Kudos to Yoon Si Yoon. Live like there’s no tomorrow. Dream like you’ll live forever. He then translates this for Luna and says that it’s his favorite saying. No matter what happens, you’re dreams are the most important thing. Luna smiles and says that she, too, is trying her best. Ren is busily working when he gets a call. It’s Kei! The older man invites him out for a drink. Ren asks if Hirouchi put him up to it. Kei laughs and says he just wishes to meet with Ren. That should be okay, shouldn’t it? Meanwhile, Woo Joo finishes up and goes to leave. What happened to Sakurai and Misaki? They went out for some food. Is Luna going to stay longer? Yep, she still has some work to do as she has to submit the project schedule tomorrow. She says that since the phone rang all day, she didn’t get any work done. Woo Joo says he wishes he could walk her home, but he has stuff to do. Luna assures him she’s fine and hopes he’ll get at least one okay tomorrow from Sakurai. Kei compliments Ren’s bold move. Ren comments on Kei’s sarcasm being in top form. Kei then says the girl is cute. Ren looks at him in surprise. Kei says that Mr. Hirouchi knows all about it and had even received pictures of Luna being in another man’s arms in the street. I guess this is part of Kei’s plot to but even more distance between father and son. Kei asks if he should give his cousin a hand. He’s serious about Luna, right? This doesn’t bode well at all. Woo Joo meets with Sung Jun who is surprised that Woo Joo invited him out. Woo Joo says it’s good for a change, besides he wants to drink some soju. The two have a drink, but dang is the atmosphere awkward. Meanwhile, Kei asks if Ren is afraid of being disinherited. Ren says that for all these years, he has kept on this path that was laid out for him. He’s disgusted with himself and sees this as his last chance to break free from his curse. Ren says he doesn’t wabt to drag Luna into this nor does he want his father to hurt her. Kei tells him he’ll help and goes off to the little boy’s room. At this time, Kei gets a text from Iga asking him about tailing Luna, which Ren sees. Sung Jun says he needs to stop being an assistant soon. Even Anne has gotten her break. If he doesn’t start taking some serious photos of his own soon, he’s screwed. Woo Joo says nothing and lets Sung Jun continue. Sung Jun has a little sister currently studying law at Sungkyunkwan (really prestigious Korean university). He’d like to help with her expenses until she graduates. This is why he’d like to start working as a fashion photographer as soon as possible. Woo Joo then asks if it was Sung Jun who attacked him that night. We cut to Kei returning from the restroom to find Ren gone. He looks at his phone and looks towards the exit. So…Ren pretty much knows he’s up to no good now, but I bet Ren had his suspicions before. Meanwhile, Woo Joo asks why Sung Jun has the same shirt as the guy who attacked him. Sung Jun thinks for a little while and then decides to feign innocence. There’s probably tons of guys with similar shirts out there. Woo Joo then says he isn’t blaming Sung Jun and just wishes to know who put Sung Jun up to it and if it has anything to do with Luna. Sung Jun looks like he wishes to tell Woo Joo, but still plays innocent. There is no reason for him to attack Woo Joo. And that’s where this episode ends. My guess is only that Sung Jun did it for the money since he wishes to help out his little sister. Well…I can’t dislike him if that’s the case, but he shouldn’t have done something like that as I’m sure his sister would not approve of her big brother doing bad things to fund her education.